We've talked about the legendary Blue Glow-tini and Dad's Electric Lemonade, but today we've got another glowing review for a Disney cocktail that will light up your celebration in a whole new way. It's blue, it's red, it's a magical delight with a fun souvenir glow cube that can't pick just one color! A standard on the Disney drink menu, you can find The Magical Star Cocktail in restaurants and lounges across Walt Disney world property. Like many of Disney's original cocktails, the taste of this one is sweet and fruity with a playful dash of coconut. I'd say that it would transport you to someplace warm and sunny, but if you're sipping one of these you're already in Florida! The tropical flavors of the Magical Star come from X- Fusion Organic Mango and Passion Fruit Liqueur, Parrot Bay Coconut Rum, and Pineapple Juice. These 8 ounces of fun will set you back about $10.50 per drink. 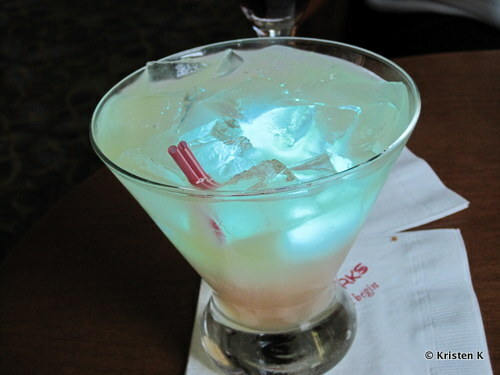 A pale, slightly milky colored concoction, it seemingly changes color in your glass as the glow cube inside goes through its charming light show. Bright fruity flavors mask the alcohol, which means if you aren't careful this little specialty can catch you off guard. My drinking companion learned that the hard way after he inadvertently down his drink like it was fruit punch. If your taste buds want a tropical treat with very little taste of alcohol Disney's Magical Star Cocktail may be just the drink you're looking for. Cheers to Erik H. for being my official taster for this fun Disney drink. Have you tried the Magical Star on your Disney Vacation? Leave a comment and let me know what you thought! 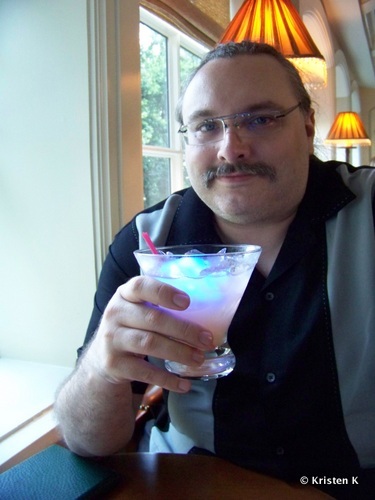 I've had the Magical Star cocktail a couple of years ago. It was good. Gotta love a light up drink! Do they make these in Disneyland? That's a great question Starwood! I'm afraid I don't know the answer to that, but it never hurts to ask the bartender if they can whip one up. We are going to DL 6/11 I will have to ask if they can make one. I'm always hesitant to ask because they usually look at me like I'm crazy. I just returned home from a trip to Disneyland and yes they do have this drink in California Adventure. Enjoy! I had a chance to drink two of this delicious drink "Magical Star Cocktail! Yummy, yummy! If you get a chance to go to the Hollywood Studios in Disney World please stop by the 50's Prime Time Cafe and enjoy this drink as well as the food and the 50's scene. Loved it! Be warned! Between the Coconut Bay Rum and the x-fusion liquor there is around twice the alcohol of a normal cocktail-so be careful! It does taste great, and you get a glow cube-that's tough to beat. Take your time drinking this one, and limiting to two at one session is probably a good idea. Enjoy!